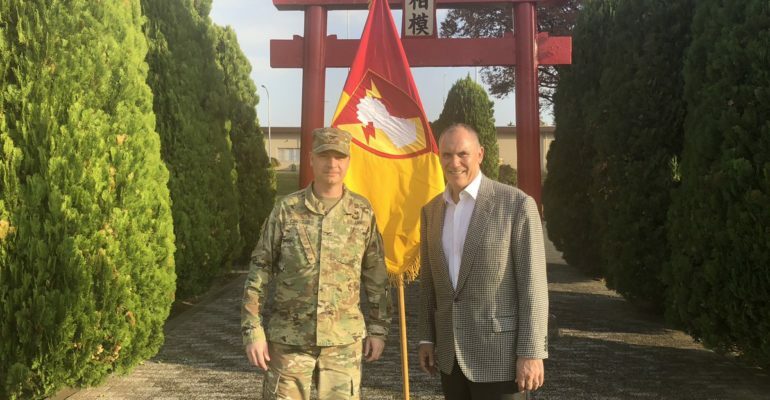 Riki Ellison with Col Pat Costello at the 38th ADA Brigade at Sagami Army Depot, Japan on November 27, 2018. The pacific island chain of Japan extends a vast range of 1,900 miles from north to south on the western front of the Pacific Ocean separating itself from the Asian continental countries of China, North Korea and Russia by 660 miles of sea to its west. With the 3rd largest economy in the world, and as a strong trading partner and an avid reliant Allied partner with the United States for this region, Japan is a critical and vital strategic alliance for the United States. Japan, in its own national security interests and within its constitution deems it necessary to self defend its vast island chain from the immediate nuclear medium-range ballistic missile threat from North Korea. Growing provocative Chinese actions to include artificial island actions in the South China Sea are expanding a significant threat to the region. Regular and consistent air intrusions of Japanese air space by both the Chinese and Russian air forces is a valid issue of concern. Japan, by its limited constitutional self defense force of land, sea and air military components is addressing these three branches to self defend Japan in capability and capacity. The Japan Air Self Defense Force (JASDF) takes responsibility today from the new Air Operations Center in Yokota Air Base in the Command and Control of Japanese Air Space for identification, discrimination, deconfliction and firing solutions of air and space breathing threats. The JASDF also has Command and operations of its Patriot point defense systems with 7 Battalions deployed around Japan. Notable too is that the JASDF plans to acquire 100 additional F-35s, adding to the 42 F-35s expected by 2024. The F-35 platform has discrimination firing control sensors and boost phase intercept capabilities inherent to its design. The Japan Maritime Self Defense Force deploys four Kongo Class Aegis BMD destroyers at sea that have SM-3 and SM-2 interceptors coupled with SPY -1 radars for early warning, tracking, discrimination and intercept of missile threats to Japan. In a historic first, the Japan Ground Self Defense Force (JGSDF) is taking command and operations of the two land-based new Aegis Ashore sites in Japan that are planned for operational deployment in 2023 for the homeland defense of Japan. The other three land Aegis Ashore sites in the world today are in Hawaii, Poland and Romania and are commanded and operated by the U.S. Navy. This provides a significant new mission and a new responsibility to the 100,000 manned Japan Ground Self Defense Force which will have to incorporate an integrated air and missile defense capability with a ballistic missile defense capability that involves sensors and interceptors. These new JGSDF Aegis Ashore sites will be fused into the Japanese AOC in Yokota Air Base for a true joint cross domain C2 system, a first for an Allied partner nation. By valor and power due to the strategic importance of Japan to the United States for stability in the region and the critical air and missile defense mission for Japan, the United States activated and deployed this year, the 38th Army Air Artillery Defense Brigade to Japan on October 31, 2018 at Sagami Army Depot, Japan. Having a US Army Brigade in Japan will provide an enabler for the Japan Ground Self Defense Force for its new mission, bring forward infrastructure and direct support of the IAMD and BMD mission for the U.S. 5th Air Force, direct support for the two U.S. TYP-2 radars in Japan and the 1-1 ADA Battalion deployed in Okinawa, and support a bilateral C2 Cross Domain AOC in Yokota Air Base. In addition the 38th ADA will directly support the THAAD battery in Guam. Japan is a tremendous ballistic missile defense partner with the successful co-development of the SM-3 Block IIA Interceptor, its upcoming additional Kongo class Aegis BMD ships and Frigates, its Aegis Ashore sites, its Patriot systems, its co-production of SM-3s, its hosting of US TYP-2 Radar sites and its facilities support for the US Navy and Marines throughout Japan. It is the land of rising missile defense.